The all terrain power scooter sheelchair for sale has a headrest, an armrest, an adjustable seat, an adjustable steering post, two front and two rear auxiliary lights, a large headlight and a heavy-duty battery with up to a 35 mile travel range. The scooter has adjustable four wheel suspension making it possible to ride with confidence on various terrains. This wheelchair scooter is great for taking you anywhere you need to go in the snow, a vacation at the beach or on trails in the woods. If you would like more information or to talk about pickup and delivery of the wheelchair scooter you can reach me using the comments form found directly below this ad provided by GoGoCycles Used Motorcycles for Sale. 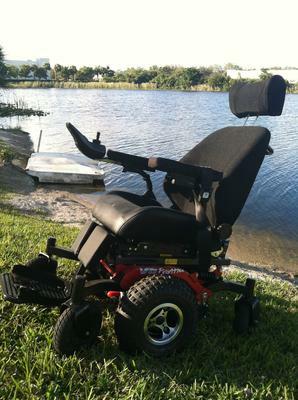 The All Terrain Power Scooter Wheelchair for Sale is in Cape Cod and in my opinion is the best most fully equipped mobility scooter that you can buy. Email me regarding the All Terrain mobility scooter and mention that you found this ad on GoGoCycle's Used Motorcycles and Parts for Sale www.gogocycles.com. I desperately need a wheelchair I have fallen several times due to bad knees and I am not strong enough to use a cane or walker so that I can have more mobility.I am interested in this but I don't see a price. I am interested in this wheelchair. Please advise as to price, condition, etc. Thanks.